Because we refuse to discuss death and the dying process, we are often left clueless about what our parents would have wanted when an emergency occurs. Did she want every possible measure to save her life, regardless of any additional suffering those measures might impose? Or would she want to discontinue all but comfort care when there was little hope of recovery when such treatment would only extend the dying process? Researchers tell us that over half of us have not discussed end-of-life wishes with our parents. And even though 70% of Americans say that they would like to die at home, 70% of people actually die elsewhere, in a hospital or long-term care facility. Only 7% of people report having visited with their doctors about end-of-life care, although 80% think it is important to do so. And although 82% of people think it is important to put their desires in writing, only 23% have actually done so. Our days are indeed in God’s hands. Each day is written in His book. But modern medicine causes us to question where our desires for our loved ones intersect with God’s providence. I will be forever grateful that my parents took the time to write their wills and appoint financial and medical proxies. I am equally thankful that my mother took it a step further and assembled important information into one notebook to make it easier for me to handle her affairs after she died. She began this notebook while in her early fifties and updated it as necessary all the way through her remaining years. She died at age 87, so that was a lot of updating. I have begun calling the notebook she designed The Family Notebook and have now assembled one for our children. The Family Notebook can be a helpful way to ease into a conversation about your parents’ desires in the later stages of their lives. Although many will feel that these are morbid discussions, knowing that your family members know your wishes and have the legal means to carry them out can give a person a lot of peace. When talking with your parents about this, assure them that you aren’t trying to take over their lives and that you aren’t asking to see the contents of their Family Notebook. 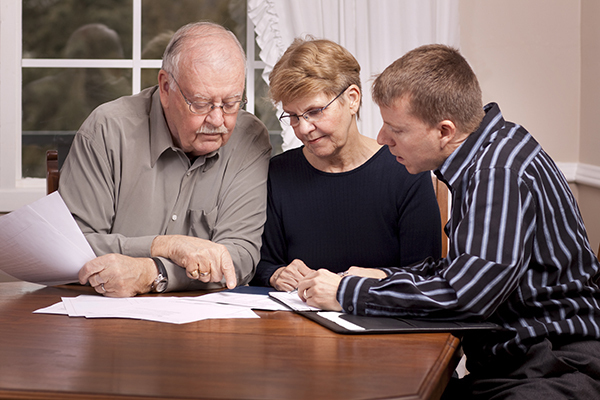 Many older people don’t feel comfortable sharing their financial information with their children, for example. Tell them that you merely want reassurance that they have put their information in writing in case of an emergency. My mother regularly reminded me that her notebook was on the shelf above her desk. It simply had my sister’s and my names on the outside, nothing that would call attention to it. She wanted to be sure that we could easily find it in an emergency. Other families place their Family Notebooks in an inconspicuous spot next to the photo albums. Indeed, we used Mother’s notebook extensively from the time she died and through the following months as we settled her estate. She had prepared it so thoroughly that we didn’t even require a lawyer’s services. I was able to file all of the necessary paperwork at our local courthouse and by mail. This not only saved attorney fees but also preserved her privacy. Current events remind us that even those of us who are not serving in war zones can suddenly have our lives taken away. The recent church shooting in a small town in Texas is a good example. I doubt that any of those church members expected to die on that sunny morning when they dressed themselves and their children for church. Hopefully, they were among the 23% who had completed their wills and had the necessary conversations with their loved ones. A much more likely scenario for needing this kind of information is for an elder to suffer a stroke or heart attack. One woman I know told about her mother who refused to have any end-of-life discussions with her daughters. Then she suffered a stroke that took away her speech. The mother had never signed medical or legal power of attorney documents stating who should make decisions on her behalf in the event of her inability to state her wishes personally, and now her daughters’ worst fears had materialized. Her daughters, who want to care for their mother, will have to file for custody of the mother through the courts so they can move her to the state where they live. How they wish that their mother had been willing to state her preferences and sign proxy documents before the need arose. The upcoming holiday gatherings are a great time to start the conversation with our loved ones. You need not cover everything at once, but perhaps just announce a family meeting. Have someone watch the children so you’re not interrupted. Be ready to show your parents what you are doing to prepare for what will hopefully be the distant future and invite them to start the process, too. Advance preparation eases everyone’s mind and allows us to make decisions for those we love that are in line with Scripture and with their wishes.